LONDON--(BUSINESS WIRE)--Infiniti Research, a global market intelligence solutions provider, has just released their new competitive intelligence study on the healthcare equipment industry. A renowned healthcare equipment supplier wanted to identify prospective competitive gaps and build a powerful marketing strategy to improve their business performance. With the increasing demand for quality and affordable healthcare, governments have started increasing their efforts to meet the needs of the end-users. With the continuous innovation in technology and design, primary healthcare equipment providers have started planning to upsurge competence in their product offerings while meeting the quality requirements. Request a free brochure to see how Infiniti Research’s solutions can help you. 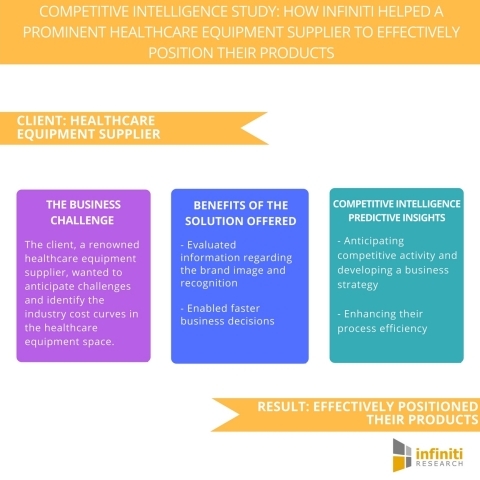 The market assessment solution presented by Infiniti helped the client predict challenges and classify the industry cost curves in the healthcare equipment space. The client was able to identify the key performance indicators and increase the efficiency of their marketing efforts to improve ROI. The client wanted to anticipate challenges and identify the industry cost curves in the healthcare equipment space.